Kumite International (KI) is the official Martial Arts program of The Western PA Police Athletic League and legally represented by the prestigious law firm, Eckert Seamans Cherin & Mellot LLC. The organization operates daily to support contemporary sport karate athletes. 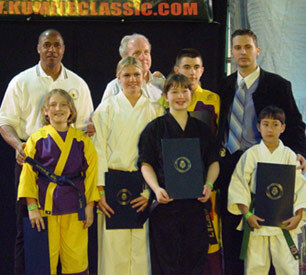 Kumite International wins "Children's Choice Award"
Kumite International is awared the "Children's Choice" award at The Arnold Schwarzenegger Martial Arts Games. Accepting image awards are Bill Viola and Michelle "Mouse" Krasnoo. Presenters are Erik Jones, CEO Black Belt Television, Gary Lee, Director of The Living Legends, and Tokey Hill, Arnold Martial Arts Director. Kumite International continues to "FIGHT" for the recognition of sport karate champions! KI is dedicated to the growth, advancement, and recognition of martial artists through financial aid and educational scholarships. KI provides cultural, recreational, educational, and social activities that encourage building positive character traits. The foundation strives to instill physical fitness, good sportsmanship, and high moral standards through martial arts within a safe, non-partisan, and professional atmosphere. KI is organized for charitable purposes related to promoting sport karate and its athletes in the U.S.A. and abroad. The activities include the establishment of educational scholarships and charters, developing public relations and entertainment projects, sponsoring travel and demonstration teams, and the implementation of an extensive competition circuit. The projects help foster and encourage youth to believe in themselves while emphasizing the importance of self-esteem, self-confidence, self-control, self-respect, and the spirit of loyalty and faith in American traditions and institutions. KI promotes and safeguards the interests and general welfare of youth while providing a safe atmosphere to occupy their time with positive reinforcement. Promotion of sport karate, its athletes, and way of life in the USA. Kumite International (KI) is the premier organization in The United States supporting scholastic sport karate athletes and underprivileged martial artists. The non-profit organization regulates a complete circuit of regional, national, and international events. Kumite International harnesses a powerful and professional martial arts network that oversees the progress of elite karate athletes throughout The United States. Kumite International is dedicated to upholding traditional values of karate-do while preserving the ethics, integrity, and character of sport karate. KI offers a competitive arena for world-champion athletes, while emphasizing age-old traditions of discipline, honor, and respect. 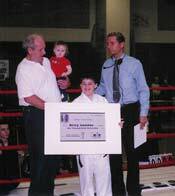 The organization is proud to make history, paving the way for the first karate scholarship movement in America. Kumite International is structured to unify sport karate leaders, providing an open forum for communication and new ideas. KI has developed technical and athletic committees, councils, and advisory boards to spearhead contemporary martial arts issues. The organization offers a strong unified voice promoting karate into mainstream life assisting youth attain financial assistance, endorsements, and sponsorship. Kumite International is the unified choice; devoted to the recognition, progress and advancement of scholastic athletes.